Are you worried that you have an aggressive puppy? In my experience as a trainer working within a large veterinarian clinic, I realized that puppy aggression was one of the most commonly misinterpreted behavior scenarios that causes distress to pet owners. Fortunately, while collaborating with the vets and behavior experts, we were able to put to rest the fears associated with puppy aggression in most cases. But at the clinic, the puppy shows none of the usual signs of biting or aggression. Without being able to see any physical or medical problems, your vet can’t offer a solution. You might still be distressed. How do I KNOW if my puppy’s bites, growls, and barking are normal phases of puppy play or if there’s a bigger problem? How do you learn how to stop a puppy from being aggressive? That’s exactly what we’re talking about today! Keep in mind that dog aggression is a controversial topic. It’s important to realize that there are lots of reasons dogs can be aggressive. So after reading this article, if you’re still not confident that the aggressive puppy growling and biting is part of your pooch’s normal growth and learning cycle, you should go ahead and talk to your vet or call a trainer. Did you know there are more than 10 types of aggression characterized in dogs? In addition to snarling, growling, and biting characterized by what is considered typical puppy play behavior, there are several types of aggression that dogs can exhibit. Aggression due to fear, food, object guarding, and idiopathic biological aggression are just a few examples of more serious behavioral problems. These are all atypical behaviors that a dog exhibits in response to pain or fear, or to communicate conflict or threat. There are lots of theories as to causes and methods of treatment for dog aggression. However, misinterpreting puppy play behavior for problematic aggression is common among pet owners. Why is My Puppy so Aggressive? This includes all the behaviors considered typically aggressive puppy play. These behaviors will either intensify or weaken with maturity and training, so it’s important to learn how to stop aggressive behavior in puppies early. These behaviors turn into life skills for canines as part of their typical species behavior. Even wild animals exhibit some of these behaviors in their play. Lion cubs learn to pounce on prey. Bears learn to wrestle and bite at each other’s muzzles to protect their territory as adults. Whether or not your teacup Chihuahua will ever need to rely on her hunting or defense skills, she will likely practice them quite a bit as a pup! So what do these behaviors look like? Here are some aggressive puppy signs you might be worried about. Does your puppy do any of the following? So how on earth are you supposed to know what is normal, and what is problematic aggressive puppy behavior?! Don’t feel alone in your concerns, and never be embarrassed to ask for help! When I went to her house, I was prepared for the worst. I got there and saw the poor woman sitting on top of the counter in her kitchen while her 12-week-old Labrador puppy trotted around the kitchen barking up at her—wagging his tail. For this woman, her fear was real. She was genuinely afraid of being bitten by her puppy. But the puppy thought it was a game. We often misunderstand dog aggression because we fail to realize that dogs relate to humans and other species just as they would another dog unless we teach them differently. Is he play-bowing and wagging his tail? If your puppy bows with his forearms on the floor while his rump is high in the air, and his tail is wagging—that’s a good indicator that he is happily initiating play rather than threatening aggressively. Does he leap and pounce onto his target? That’s another sign of a game. Look for reciprocity. In play, puppies alternate back and forth with their roughhousing. Is your puppy usually only aggressive when you are playing together? Does he stop if you stop? If you walk away, does he continue to chase you and snarl? If you startle him with a loud noise like clapping your hands, will he back off? Maybe he’s teething. Teething in puppies is accompanied by a heightened desire to chew. If your puppy is just as content to chew on toys as he is to bite at your hand or feet, he might be teething. Be sure to rotate a variety of good teething toys to alleviate this issue. Does he show signs of fear or pain? A puppy that is afraid or in pain will likely become aggressive. If his ears are pinned back, tail is tucked, eyes are darting, or if he’s slinking with his whole body close to the floor, your puppy might be afraid of something. It would be a good idea to consult a behavior expert and a vet to make sure there are no other problems causing your puppy to have unhealthy levels of aggression. There are two ways to stop aggressive behavior in puppies. First, you should manage situations during which your puppy becomes aggressive. 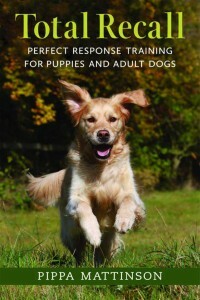 Second, you can train behaviors to shape polite play and attention-seeking from your pooch. Puppies love to chew and bite! But puppy teeth are sharp, and if your hands are turning black and blue or bleeding from what seems to be aggressive puppy biting, you should interrupt the behavior every single time. 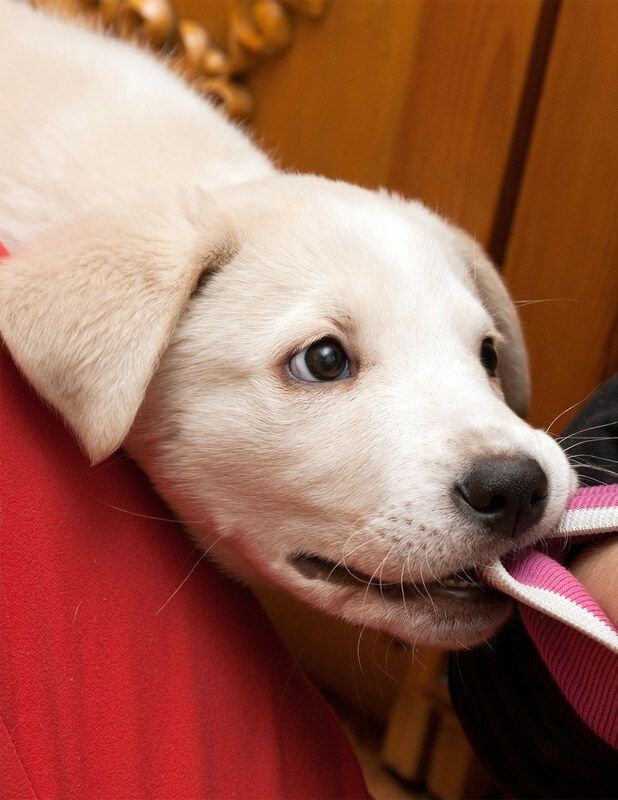 Here are some steps to manage aggressive puppy biting and other difficult puppy behaviors. To manage the behaviors, you need to manage the environment around your pup. Rough play is directly linked to energy level, so any time the play gets too rough, end the game and let your pup have some time to relax. Interrupt aggressive puppy biting and growling by standing up and walking away or removing your pooch to her resting area (crate or playpen). Learn how to stop aggressive puppy biting—interrupt and redirect his attention to an appropriate chew toy any time he bites at your hands during play or petting. Put your puppy on a long training leash during play sessions with other people or dogs. When he starts getting too rough, you can step on the leash or use the end of the leash to pull him away from his play buddies. Children tend to squeal, scream, and move around a lot—all things that trigger excitement in puppies. So use a leash and teach your children and friends how to keep play calm or stop it when it gets too rough. If your puppy tugs on your clothes incessantly or nips at your ankles, keep him on a leash. This way you can pull him away from you and redirect his attention to walking straight ahead. Give your puppy opportunities to play with other dogs and socialize properly. (Be sure to wait until he has all his vaccinations!) Dog parks and doggy daycares are good places to let your puppy have supervised socialization. Sometimes other dogs make better teachers for our canine companions! In addition to managing the environment and situations during which aggression usually occurs, here are some tips for training your puppy that will break the cycle of aggression. First, get your puppy used to being pet, handled, and snuggled without triggering rough play or chewing. Trainer Pippa Mattison has detailed instructions for this here. Teach your puppy bite inhibition. This is the process of learning when a bite is too strong or no longer part of reciprocal fun. Puppies usually learn bite inhibition early from their mothers, but you can learn some techniques for training here. Now that You Have a Plan, Put it into Action! If your puppy is under 5 months old and exhibits any of these signs of puppy play aggression, try out some of our management and training techniques discussed here. You can also look for puppy training classes in your area, as these classes typically include techniques for managing rough play in puppies. If the problems persist after a few weeks of practicing, consult a vet to make sure there aren’t any medical problems that might cause other types of aggression. For example, if you were to say, “My puppy gets aggressive at night,” I would want to rule out common medical conditions that worsen at night, such as vision problems or hormonal imbalances. Only then would we explore behavioral trends that peak at the end of the day or your evening routine that might be cause for your puppy getting aggressive only at night. If no medical conditions are discovered, and your puppy is older than 6 months and is still showing aggression, contact a trainer or dog behaviorist. 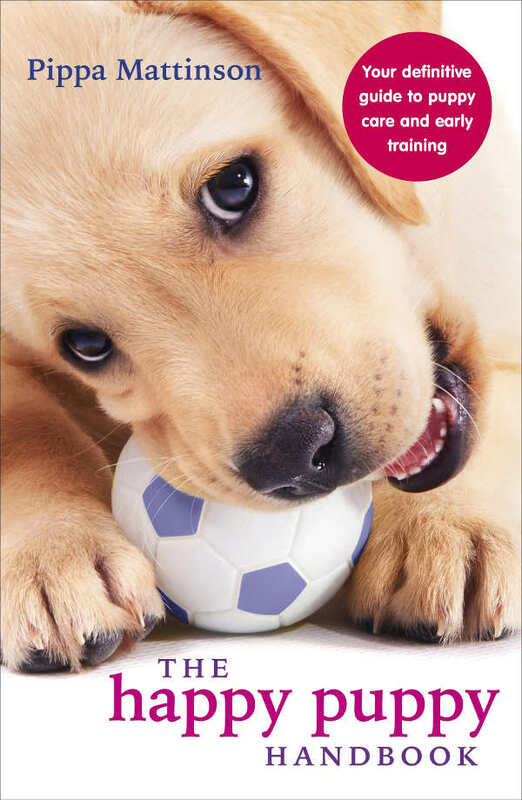 Let us know how your training is going with your puppy! 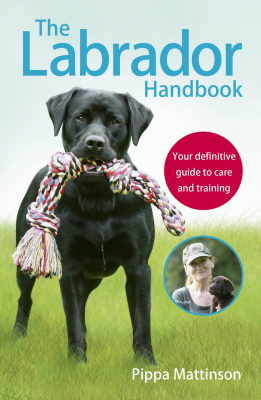 Check back in with us in a few weeks and be sure to keep an eye here for more training advice for you and your pup! An overview of types of aggressive behaviour in dogs and methods of treatment. Blackshaw, J.K., Applied Animal Behavior Science, 1991. Playing styles and possible causative factors in dogs’ behaviour when playing with humans Lilla Tóth, Márta Gácsi, József Topál, Ádám Miklósi. Applied Animal Behavior Science, 2008. Thank you for the great article, but I still have some questions. My puppy is a 9 week old Golden Retriever and has been with us for almost 2 weeks now. Golden Retrievers are known for being friendly and gentle but he has an attitude problem. My friend and I were eating snacks one day and he started barking/growling at me for not giving him any. We haven’t given him any sort of human food so he shouldn’t even know that he can have some. And another day, I was just looking at him and he came and growled at me. And also, we dropped him off at a friend’s house with adult dogs. When their Golden Retriever dog (who is about 1 year old) was being playful with him, my puppy got annoyed and kept growling at him. What are some methods to stop the growling? Your help would be greatly appreciated. Thank you! Our family welcomed a Dane puppy for Christmas this past year! What we thought was going to be this magical experience has left us with a lot of surprises! Almost like having a 3rd child! ? We love her a lot (we this momma does❤️) however we have a lot of problems with her growling when we go to try and get her get in her kennel for when we leave for a few hours for work each day. Some times she will even show teeth and turn her head and snap at us. This makes me fearful as we have younger children and I don’t want her to do it to them. Pleases give me insight as to what I can do. I have tried to bribe with treats and other mechinisms. We also have issues with her coming to us when we call her, when she is outside or even in the house about 75% of the time she refuses to come to us like she can’t hear us or is ignoring us and turns around and walks the opposite way. So then we are chasing her around the house and yard trying to catch her. ? so annoying. Any tips. I know she is just a puppy and it takes time but I need help and want to nip this all quick ecspecially the growling and biting! Otherwise the husband says she has to go back to the breeder because he don’t want her to bite the kids or baby! Your pup is only, what, 10 week old? You can’t expect to have a wonderful time with a pup until you adjust your expectations and be realistic about how much time and effort one requires. When they’re this young, they need to be with someone all of the time. She has only just left her litter and is now left all alone and locked up. I’d bite you too! Leave the crate door open and throw some treats near the back of it. Pay no attention to the crate or pup and leave her to discover the treats on her own. When she’s eaten the treats, put some more in there. You want her to think this is a magical place where treats just reappear! At first she will grab one treat at a time and back out. Still keep ignoring this behaviour until she stays in the crate and eats the treats. Now start to make a gentle fuss of her and start to refer to the crate as her ‘house’ or any word you want to use. i.e ohhh (insert dogs name) are you in your house eating your yummy treats – you lucky girl! It may take a few days to get to this stage, just keep throwing the treats at the back. Once she’s happy lying down in there (door still open at this stage), sit down and pet her in there still chatting about her house. She needs to know that the door will not be shut every time she gets in. Never use the crate as a punishment or force her in as she will not consider it as her safe space. You want her to get in voluntarily. Now that she’s happy chilling in there with her treats, close the door while she’s eating but sit down in front of it so she knows it’s alright. Keep chatting. Gradually you can move away. Stay in the same room so she knows you’re still there and keep chatting. Leave her for a few mins and let her out. Keep doing this and build the time up, gradually leaving the room and doing some chores eg. so she can still hear you’re there. As you need to leave her completely alone sometimes, once you have the above in hand, start to pretend to go out. Put on your coat and grab your keys say goodbye to her and leave. The house needs to be empty for this. Stand on doorstep for a minute or two and come back in. Keep doing this and gradually build up the time. This means she knows you are always coming back. With regards to recall, my oldest pup is 10 months and its just gotten worse as she’s gotten older! Just keep using the same recall word and use high value treats and huge well dones when she comes. Even if it’s taken you 10 mins to encourage her back. I know it’s frustrating but a dog won’t come back to an angry voice, so keep using your happy tone! She needs a reason to return to you, so make it good every time! Don’t even bother chasing her, she thinks it’s a hilarious game. Run away loudly in the opposite direction and she’ll chase you! Reward when she does this. You have rather a large dog so I would recommend training classes and lots of socialisation. Take her everywhere with you when appropriate. Get to know your dog and their habits and quickly you will be able to preempt their actions and correct them before they do wrong. Also try using a puppy play pen, put her bed and toys in it so she can play safely. This was rather long – sorry! Also, the puppy WILL bite the kids. It’s a puppy. Even if it’s just in play, it does hurt and children get dogs over-excited very quickly. 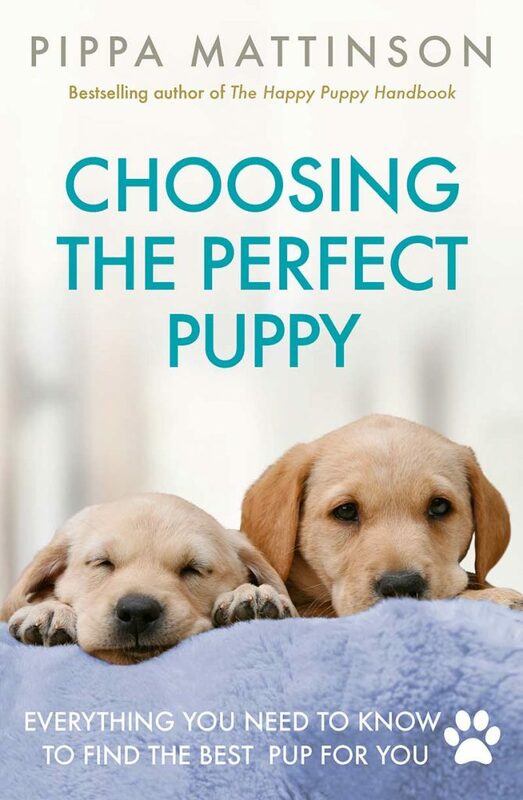 I wish people would do their homework on breeds and temperament before committing to a puppy. Each breed is different and all require a huge amount of effort. Plus need to make sure kids are old enough to understand what having a puppy is like and how to treat it properly. I have a 3/4 American pit. 1/4 lab. She’s about 10 11 months old and weighs 70 lbs. She’s always been aggressive about food if it’s something she really likes if you get her while she’s eating she gets real still and will bark or snap at me. It scares the crap out of me and try to avoid doing this but sometimes I naturally just teach down to Pat her. I love her she’s very spoiled. But I need to get a handle on it before she bites me. I have a very dominate Jack Russell Terrier that is 12 weeks old. I have been working with him and much of the ankle bitting and play bitting is under control as he is very motivated by treats. However one issue continues which is biting if you try to restrain him. For instances he is on a lap and wants down and you prevent him. He will bite your hands and hard enough to draw blood. I have started working with him about lying passively on his side . He often struggles growling and seriously trying to bite. I hold him until he relaxes and then let him up. His tentdency is to jump up snapping. I have had some success by ignoring it and redirecting him to sit and watch me for a treat. My question is am I handling this correctly? Is there a better method? If I try to keep him on his side till he gives up- which has never happened yet- he screams and fights, he will bite in frustration at anything he can reach- carpet clothing and skin. So I only make him lay on his side for a second if he relaxes and the let him up rewarding him. Just curious if your puppies are getting better and what methods worked. I just brought a dog home from the shelter. He appears to be a Jack Russel Mix. He is very aggressive with his play biting especially at certain times of the day. My golden retriever shows similar traits but the intensity has been increasing,what did you do? Thank you for the article. I’m one of those puppy parents you described, but my experience is different than above. Our puppy is 4 months old. We have two other older dogs, two cats, and three kids in our home. The puppy is kind and loving most of the time, but can snap at me when the cat is around. Or if I stop him from leaving the room he has whipped around and bit me. Today, he bit and punctured my daughter’s hand because she tried to pick up something from the floor. I get he could have thought it was a game here. I see him play like you mention above. He does that all the time! And I get pups being mouthy as they learn and teethe. This feels different. He is very dilberate when he does it. Could I be misunderstanding the situation. I have a question… My puppy (3 months old) goes pee nicely on the pad but won’t poop there! His mom trys to cover his crime by eating it ?. She is trained for going outside but when I send him out she draws him away to explore and when they come in he goes and leaves little logs by my fish tank anyway! Should I take him outside without her and how do I break him of going on the floor and teach him to use the paper indoors?